I first met Ryan during my junior year of college. We were both attending a campus ministry group called The INN and I was co-leading a small group Bible study called a CASA there (coincidentally, the co-leader I got paired with that year, Jon Peterson, later became my husband–but that’s another story for another day). Ryan was one of the core members of our CASA group way back in 2003. Before we began the “official” study in our CASA, Jon and I decided to go through a book with our group that we both shared an affinity for: C.S. Lewis’s Mere Christianity. If you’ve never read it, you should. Today. Like, right now go to Barnes & Noble and pick up a copy. Besides the Bible itself, no other book has ever spoken to me so clearly and deliberately about the Truth of God’s person and work. It was the perfect springboard for a group of college students seeking God’s will for their lives as we entered the brave new world of adulthood and independence. Mere Christianity struck such a chord with Ryan that he began spending his free time studying Lewis’s works and theology. After college graduation, Ryan married his high school sweetheart and was working a “safe” job in marketing. It was then–in the midst of his comfort and security–when God interrupted his story and called him to something totally new and unexpected: to study theology at C.S. Lewis’s former teaching grounds, Oxford. Ryan was called to leave behind the very things he had worked his whole life to achieve and follow God in faith. In his first book, Called: My Journey to C.S. Lewis’s House and Back Again, Ryan explores what it looks like for the Christian to truly surrender and follow God’s calling–wherever that may lead them. Even if that means trading a steady job for the life of a poor college student halfway around the world. Called is the story of Ryan’s journey to Oxford (where he actually got to live in C.S. Lewis’ house!) but, more than that, it is also the story of what it means to truly follow God. It is the story of the peaks and valleys, the triumphs and the disappointments, the joys and the struggles that come with following God. 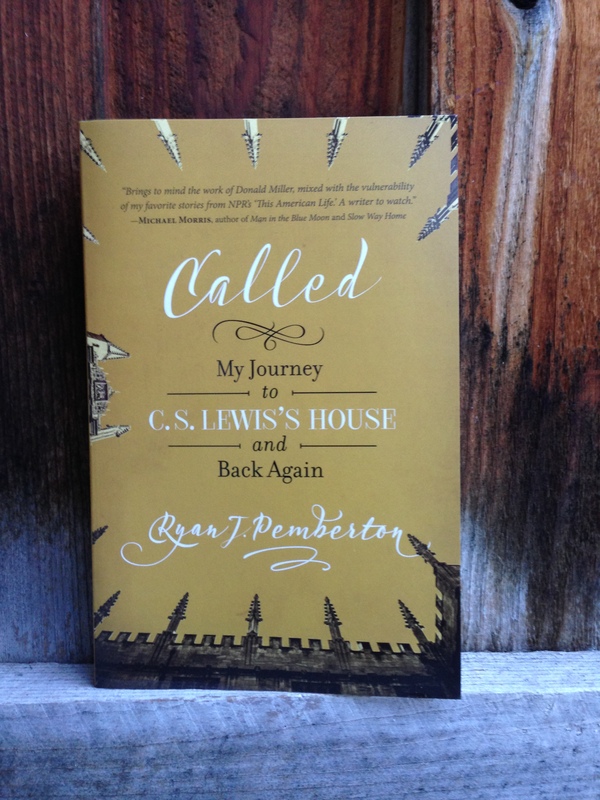 It is the story of listening to God’s calling on your life and following without abandon. No matter what the cost. And as much Ryan wrote this book about his journey, it also took me on a journey of my own. In turns, the heartfelt stories made me laugh and cry. They transported me to the hallowed halls of Oxford and the unpretentious quarters of C.S. Lewis’s home, The Kilns. More importantly, though, the stories also caused me to reflect on my own life. Where is God calling me, and what would it look like if I truly surrendered to that calling? 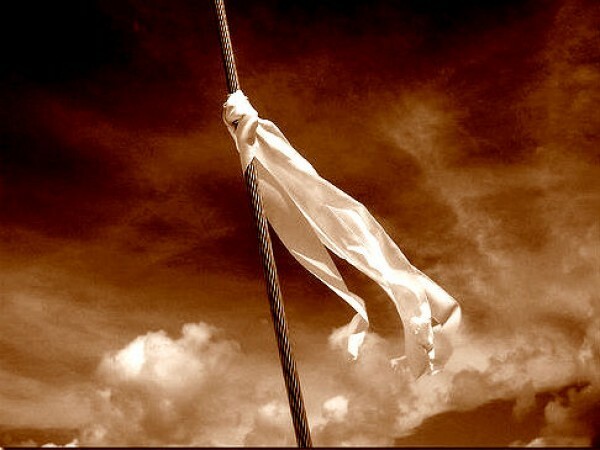 As I was reading Called I was convicted of what it looks like for me to personally surrender to God’s call. You see, I suffer from this disorder called control. In this disorder, I have the misconception that I am entitled to control over my own life and that, in fact, I am currently in control. The side effects from this disorder include, but are not limited to: disappointment, fear, regret, anger, stress and frustration. Thankfully there is an anecdote available for people like me who want to control themselves, their world, their story. Called reminded me that the solution to my “problem” is one seemingly simple act: surrender. We must lay aside control over our own plans and surrender to the calling God has in our lives. Then, and only then, is when the most beautiful story of our lives can finally be written. In the midst of this most difficult season that I find myself, I would like to surrender my story to God so that He might write the beauty into my pain. As a writer, I know that the author has a purpose in their writing–a goal they are hoping to achieve. So as I go through this journey called life–with the peaks and valleys, the triumphs and the disappointments, the joys and the struggles–I will trust in God’s plan for my story. After all, I am the main character in this story, experiencing as I go, but only God knows the ending. I am humbled that I got to witness part of Ryan’s journey as he followed God’s calling. I am equally grateful that he wrote it all down in his book for so many of us to benefit from. It is my hope that you, friend, will find the beauty that God has written into your story. And if you need a little inspiration, pick up a copy of Called–you won’t be disappointed! 172. That’s how many individual items composed the mountain of laundry. 172 shirts and pants and socks and towels and sheets and pairs of under-oos that needed folding and ironing and put-away-ing. Every time I looked at the massive pile I did a double-take to make sure the clothes weren’t actually multiplying before my eyes. I mean, seriously. There was so. Much. Laundry. I wasn’t quite sure how to begin tackling Mt. Laundry, so I just sat and stared at it for a moment before digging in. I needed to formulate a game plan. As I contemplated the massive chore that lay before me, though, a funny thing happened. Not “haha funny”, but ironic funny. As I sat there trying to avoid the tedious task that lay before me, I felt an overwhelming surge of gratefulness. Let me explain. You see, that pile of laundry was sitting there because I have laundry to do. Each shirt, each pair of pants, each mismatched sock represents clothing that my family owns and wears every day. We have beautiful clothes that fit us properly. We have warm clothes for when it is cold outside, we have swimsuits for when we play in the water, we have rain gear to wear out in a storm. We chose our clothes from a store or received them as gifts or were given them as hand-me-downs (sorry, little brother, but this is your destiny for all eternity…or until you can start buying your own clothes). We have so many clothes that we regularly have to sort through our dressers and our closets to pick out clothes we no longer wear so we can make room for new clothes. We have so much, and I am grateful. The sheets and towels in the pile represented extra beds that were filled in our house the last couple of weeks. Guests that traveled from faraway, exotic places (like Seattle) to visit us. Friends and family that went out of their way to spend time with us. Adventures that we shared together while they were here. We have amazing friends and family, and I am grateful. The dress shirts I got to iron (I’m going to say “got to” instead of “had to” here because I’m on a roll. But don’t get me wrong. I despise ironing with a fiery passion.) were so my husband can look presentable at his job. His job that he loves and, I am convinced, was created to do. His job that provides so fully for our family that I do not have to work outside of our home. His job that allows me to wear yoga pants every day instead of dress shirts (can I get an Amen?). Our needs are provided for, and I am grateful. The fact that I have clean, dry laundry points to the fact that I have a washing machine and a dryer. IN MY HOUSE. Does that not boggle your mind? I have my very own machines that do all the hard work for me. I don’t have to walk down to a river or draw water from a well, scrub clothes on a board with soap that I made with my own two hands, or even wait for my clothes to dry in nature’s time. It’s not even like my college days when I had to walk down to the basement in my dorm to put quarters in a machine or my Ireland-days when I had to walk through the rain and the mud to get laundry out of our garden shed. I have every convenience at my fingertips, and I am grateful. But here’s the real kicker. 172 pieces of laundry means that there are people in this house that I get to love and care for each day. There are children who call me Mom and a husband who calls me Helper. 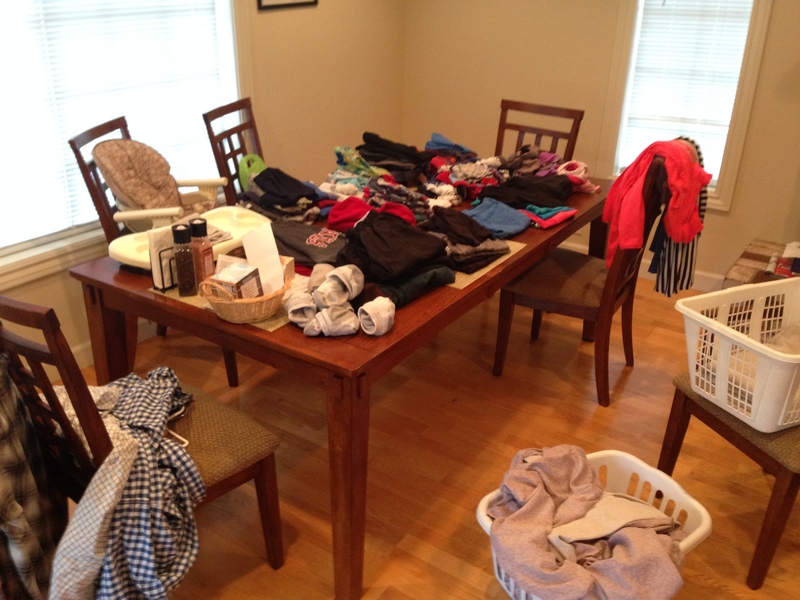 And I GET to serve them every time I do a seemingly tedious task…like the laundry. And even though meaningless tasks consume most of my days, I will be grateful. The pile of laundry that needs folding or the floor that needs vacuuming or the toilet that needs scrubbing or those mouths that need feeding represent more than the task at hand: they represent the people and the privilege behind them. Some day I may not have meaningless tasks to do or people to do them for so, in this moment, I choose to be grateful. If you’ve been following my posts lately, then you know I was SO over January. When February 1 rolled around last weekend, I seized the opportunity to start something new. I “took down January” (recycled all of the paper snowflakes we had hanging around the house) and decided it was time to “put up February” (cover my house in hearts). Plus, since Jon was off for the day starring in his first major Hollywood blockbuster (OK, he was just an extra in a new Steve Jobs movie, but I’m sure he rocked it!) I took advantage of the quiet morning at home with the kids to do a little Valentine project. 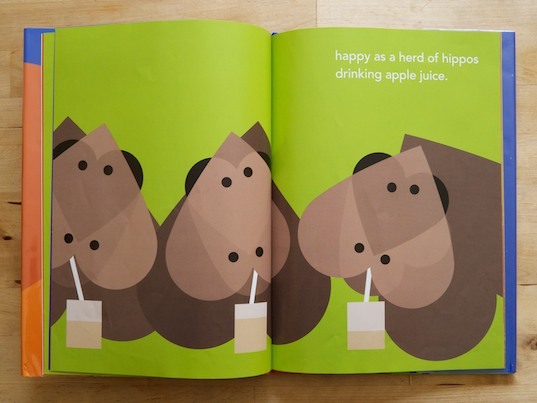 Each page features a different heart animal, and my boys couldn’t get enough of them. 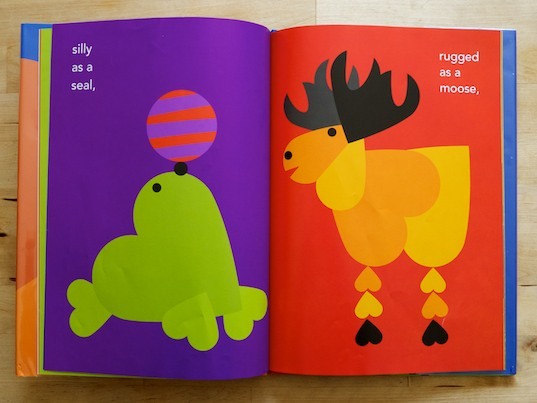 After reading the book for about the 5,000th time that week, David suggested that we make some heart animals of our own. And, since I’m never one to shy away from a cheesy craft, I obliged. 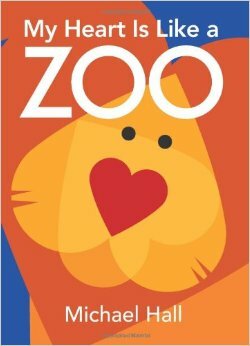 We (and by we, I mean I) set to work making our little love zoo. 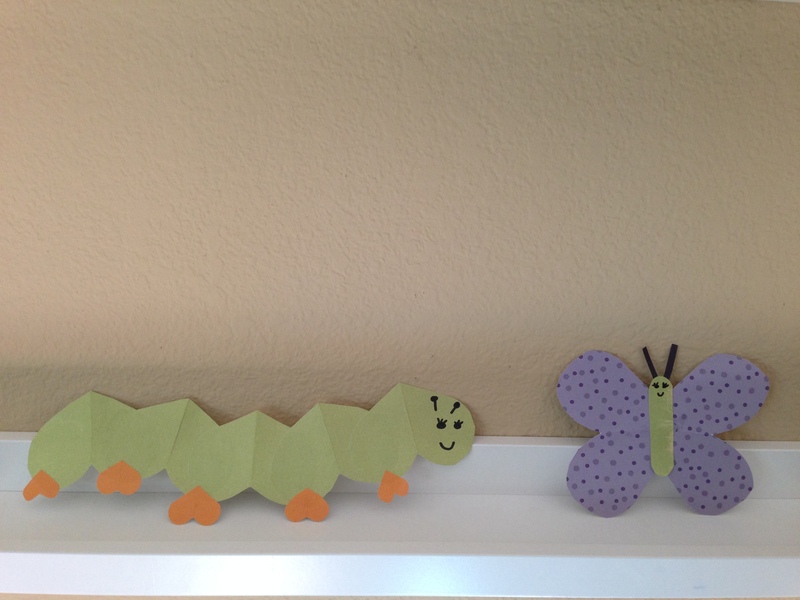 ~Paper–any paper will work, but I used a combination of construction paper and scrapbook paper. 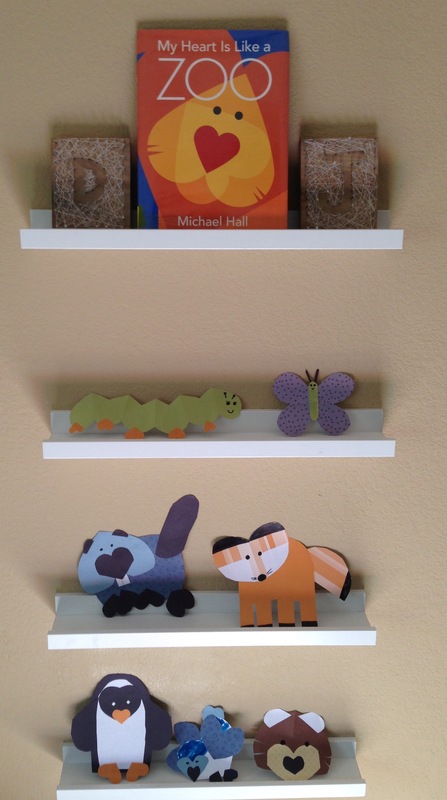 If you want more sturdy animals, use colored cardstock. ~Decide what animal you want to make. After making about a dozen of these critters, I’m convinced that you can make any animal imaginable out of hearts. If you need some inspiration, see my creations below or search Google or Pinterest for “paper heart animals” and you’ll find more animals than were on Noah’s Ark. 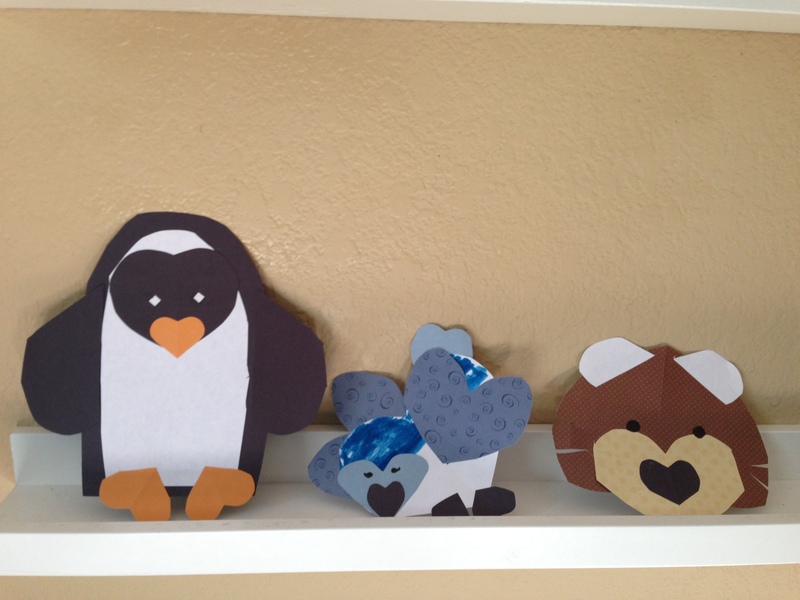 For instance, did you know that you could make a penguin, a blue jay, or a bear out of hearts? 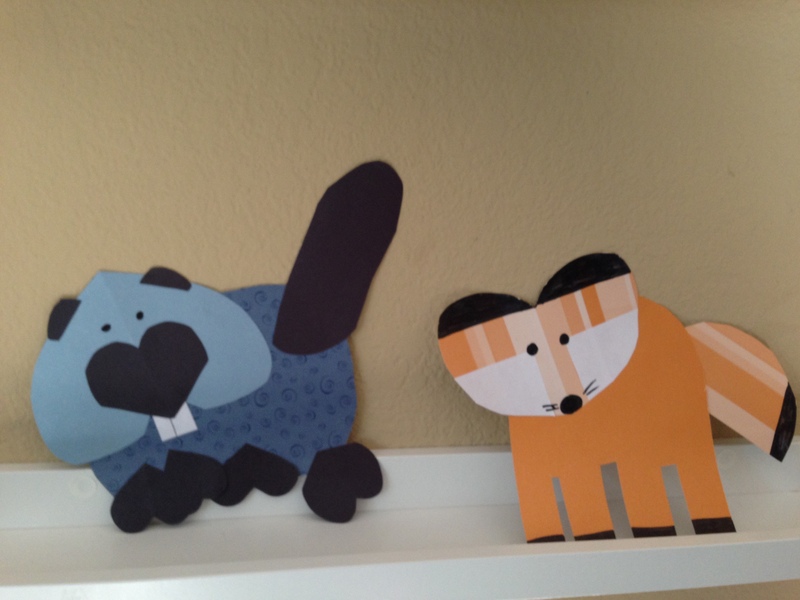 ~Next, choose what papers you want to use for each part of the animal, and just go to town cutting out hearts! I did the good ‘ol fold-your-paper-in-half freehand method for my hearts, but you could certainly use some other more-precise technique if you have the patience for that sort of thing. 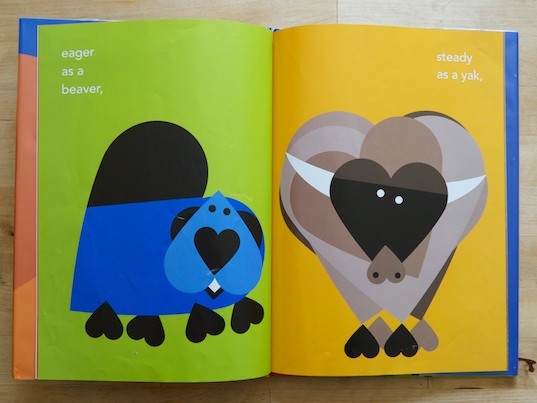 Cut out hearts in many sizes and colors to use for the different parts of your animal. ~Start puzzling together your animal. Cut hearts in half to make oval shapes, turn the hearts in different directions, or cut the points off the bottom of the hearts to make triangles–it’s amazing the different shapes you can form from simple hearts! If there’s a part of your animal that doesn’t lend itself to a heart-shape, I also give you permission to just cut out whatever random shape of paper you need. You’re welcome. ~After you’ve laid out your design, glue it all together. Use a black marker to add details like a nose, mouth, or whiskers. And that’s it! Each animal only took me a few minutes to make, so I had a whole Valentine menagerie by the time my boys had finished watching Veggie Tales (yes, I also give you permission to enchant your children with television while you get lost in kids’ crafts that they should be helping you with). This weekend we finally said goodbye to January. Goodbye, and good riddance. Never in my life have I been so glad to see a month end. January 2015 was, hands-down, the most challenging 31 days I’ve ever been dealt. The entire month was just an endless string of one let down after another, one loss after another, one upheaval after another, one tearing apart of my perfect little organized, well-planned, predictable life. The month started with us saying goodbye (again) to our loved ones as we left our Christmas holidays in Washington and returned to our “normal” life in California. Saying goodbye was rough. A few days after arriving home we visited the doctor to confirm our recently-discovered pregnancy. What was supposed to be an exciting time of preparing for our new baby quickly turned into unsettling discussions followed by even more disturbing test results as we learned that our baby would never be born. My miscarriage (discussed further here) was, and continues to be, a physical and emotional roller coaster that I was in no way prepared for. The whole thing is R-O-U-G-H, ROUGH. I would have been fine with the life-change stopping right there for the moment, but as they say: when it rains, it pours. A few days after we found out that we’d lost the baby, we went for a family hike to try and clear our minds a bit. David had brought along Mimi, his stuffed monkey lovey, on the hike. In the moment we didn’t think too much of this because, as David’s lovey, Mimi has gone with our family everywhere we’ve gone for the last 4.5 years (which, by the way, is the same total time that David has gone with us everywhere we’ve gone). Mimi was at the hospital the day David was born. Mimi snuggled David to sleep when he was a baby. Mimi played endless hours of basketball with David when he was 2 years old. Mimi moved to Ireland with us when David was 3. Mimi traveled the world with us: she went to the top of the Eiffel Tower, rode in the London Tube, and sunbathed on beaches in Spain. Mimi comforted David when he was moved to a new home, new school and new community for the 4th time in his short life. David loved Mimi more than anything, she was his WORLD. So, here we were, out on our hike with the whole family +Mimi and life was grand. I even got a picture of David and Mimi at the top of our hike so we could remember what good little hikers they were. But, somehow between the top of our hike and bed time, Mimi went missing. She was not in the house. She was not in the car. Mimi. Was. Gone. David was inconsolable at bedtime, so I did what any rational parent would do. I called the restaurant that we stopped at for lunch after the hike–and all of the other restaurants and businesses within a 2-block radius of there. No Mimi. I left voicemails for the security that I knew checked the area where we were hiking. No Mimi. I enlisted my running friends to retrace our steps on the trail (a huge thank you, by the way, to the dozen or so of you who did that!). No Mimi. I put ads on the lost and found section of Craigslist. No Mimi. NO. MIMI. I don’t know if it was because we were already experiencing another type of loss or just because I really loved Mimi (because, really, she has loved my boy very well), but losing that silly monkey just wrecked me. I lost sleep over it. I’m crying right now just thinking about it. Losing Mimi was rough. For all of us. Two days after the Mimi fiasco, I lost something else. The Bible study that I’ve been involved with for the past 10 years, the Bible study that I love and look forward to every week, the Bible study that has been my constant through all of the moves and changes and upheavals, decided they were done with my family. They asked us not to come back…for awhile…but I’m not sure if that’s such a good idea any more. I was shocked and I’m still not sure how I feel about the whole thing–and I still really do love the group and what they stand for–so we’ll just leave it at that. Another loss, another change, another rough patch. And then, just to add a little madness to the mayhem, we got word that our landlord here in California had died a week before Christmas. Well, not so much died, as he was murdered in his new home a few miles away from where we now live. Nobody really had a plan for this, so now our agent and the landlord’s brother and some attorneys are scrambling to figure out what to do. I don’t know if we’re going to be kicked out of our house (worst case scenario) or if they’ll decide to *sell us* the house for dirt cheap just to get it off their hands (best case scenario), but it’s just another thing. Another change, another challenge, another confusing and rough experience. In summary, my January SUCKED. There were moments when I just wanted to push stop or rewind or erase so I could make it all go away. But if I’d done that, I would have missed a lot. Because, despite the pouring down of rough sucky-ness, there were lots of bright spots in my days. There were bright spots like eating late-night brownie sundaes with my “comfy” friends (you know, the dear friends who you are so comfy around that you make a pact to wear sweats and messy hair when you hang out). Bright spots like handwritten notes. Bright spots like the neighbor that brought us dinner and a box of doughnuts. Bright spots like David’s teacher telling me how proud she was of his effort in school. Bright spots like the gift of a day out and some pampering (shout out to Val because, seriously, I have the best friends.). Bright spots like Jacob holding my face in his tiny hands and saying in his most earnest toddler voice, “Mommy, I LOVE you. You’re pretty.” Bright spots like Jon doing all the dishes WITHOUT ME EVEN SAYING A WORD ABOUT HELPING WITH THE DISHES. Through all this, I’ve come to realize that no matter how ridiculous life might get, there are always bright spots. In order to find the bright spots, though, sometimes you have to do more than just look for them. Sometimes, you have to surrender first in order to find them. When you’re at that place of raw vulnerability, that place that I’m at now, you have to acknowledge that you simply can not depend on your plans, your dreams, your expectations. In the now-infamous words of Elsa of Arendelle, you have to “Let It Go” (OK, I may have watched Frozen with my kids a few (dozen) times this month when I couldn’t find the will to move off the couch). But, seriously, sometimes you just have to throw in the towel and say I can’t do this. Because, really, you can’t. I can’t. We can’t. And we’re not supposed to. We were not created to handle, on our own, all that life throws at us–because, if we were, then there would be no need for God or a Savior. We were not created to carry the burdens of the world on our shoulders, because nobody’s shoulders are sturdy enough to carry that burden. No, we were created to surrender. We were created to need the God who created us, to surrender to the Savior He sent us, and to move confidently forward knowing that He has freed us. You have to acknowledge that there are times when life is tricky and confusing and maddening and rough. And you have to lay it all down at the foot of the cross and LEAVE IT THERE. You have to give it all up and let God take the reigns on your life. It’s not easy to do, but it’s worth it. I’m at the breaking point, and I have a choice: I can rely on my own strength–and ultimately crumble–or I can surrender to God who will strengthen me. Hiding behind my own comforts and well-thought out plans isn’t going to work right now, because all of that has already been stripped away. I am left with one option: surrender. Surrendering to God’s will is the only way to truly move forward, so that’s what I’m choosing. I’m surrendering January (praise the Lord!) and letting it all go. I’m surrendering the trauma of the miscarriage and the loss of our beloved Mimi and the questions that remain about my future. Because it’s not worth holding on to all that rough-stuff alone, and I know that I can’t live in the “now”, let alone move forward, if I’m carrying that burden alone. It’s too much. And, since I know the solution to this particular set of problems, I’m going to take it. I’m waving the proverbial white flag like a madwoman. I’m surrendering my life, my circumstances, my very heart to God–and sitting back to watch Him work. Goodbye January, and hello, February. Out with the old, in with the new. It’s time for a fresh start. Moving forward, now!